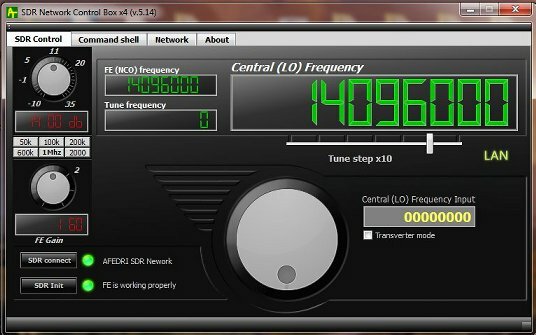 Below is a working folder with a beta test SDRSharp v1637 having one S-meter, Yaesu CAT control, and a Center Frequency auto correct method to solve noise spike problems seen with Afedri SDR-LAN when the operating frequency is the same as the DC Center Frequency at transmit. There is also a Spectrum Center button added. 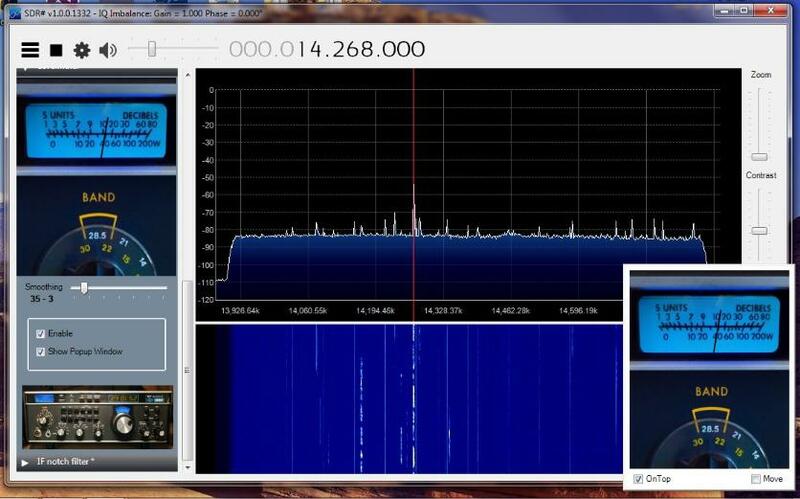 Serial controller will mute the SDRSharp receive audio when the connected Yaesu transceiver is put in transmit mode. Enter Afedri LAN address - LAN must be enabled. Click gear icon at main screen. 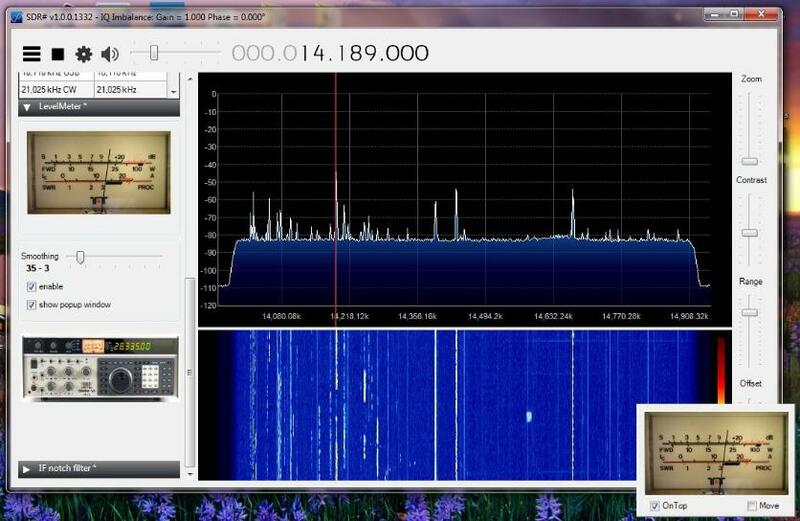 This plugin allow SDR# to be controlled via serial (COM) interface with set of Yaesu CAT commands. 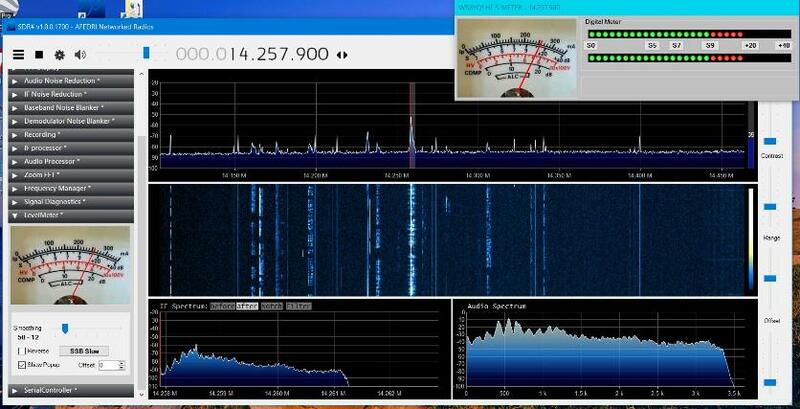 - Mutes SDR on transceiver transmit. * StopBits: Yaesu (Two), Icom and TenTec (One). Also activate RTS Enable in theYaesu transceiver menu. 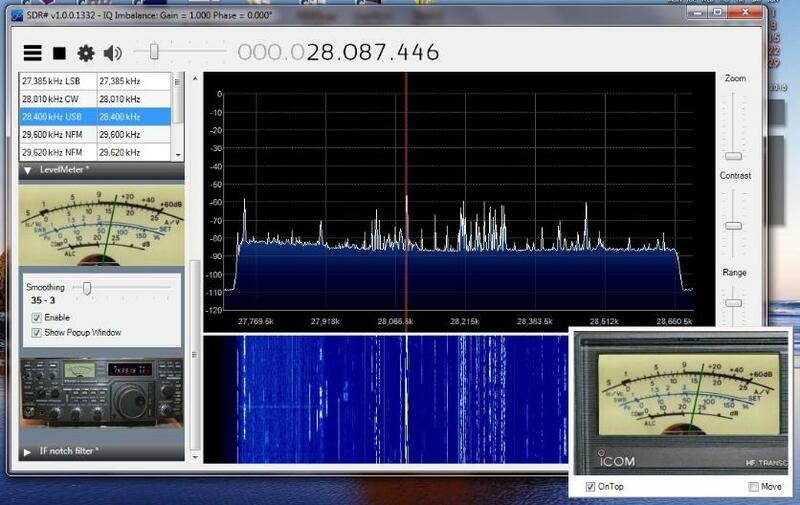 - The TenTec interface uses the Icom standard, would like to hear from users having Icom trying this. Close the SDR Sharp program then go the folder and look for the batch files included for changing from Yaesu to TenTec interface. TenTec is set for 9600bps. April 2018 - Added a fast acting digital meter, click on the S labels to change meter options. Click on A/D button to select Analog or Digital (only) meter. May 2018 - Added Icom serial controller with IC7300 meter. In addition to the SDR Analog S-meter, a new S-meter is shown below it in the serial controller section . There are batch files in the SDRSHARP1637 folder to allow the selection of YAESU, IC7300, or TENTEC serial control, RUN these when SDRSharp is not running. When "Show Popup" is checked in the left pane, the external S-meter (shown at right of pane) provides a combo window having an analog and a digital S-meter. Click in the lower right part of the analog S-meter to show only that meter or to return to the combo from analog only mode. Click on the "S0" label of the digital meter to see only the digital meter. Click on the "+20" label of the digital meter to see both of the meters again. 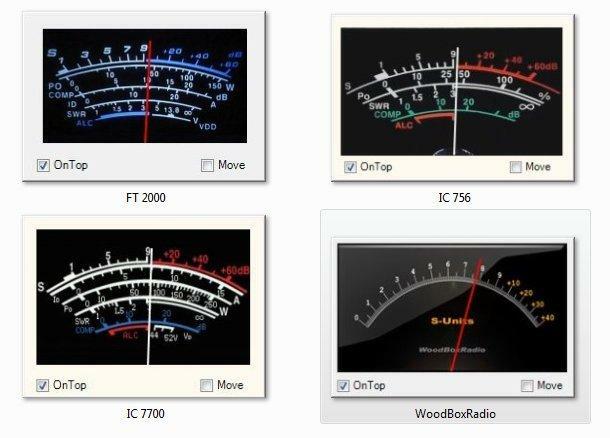 The concept is to add a full sized Spectrum Display for IC7300 at the PC using the CAT interface, and to add some convenience to the button pushing at the radio. 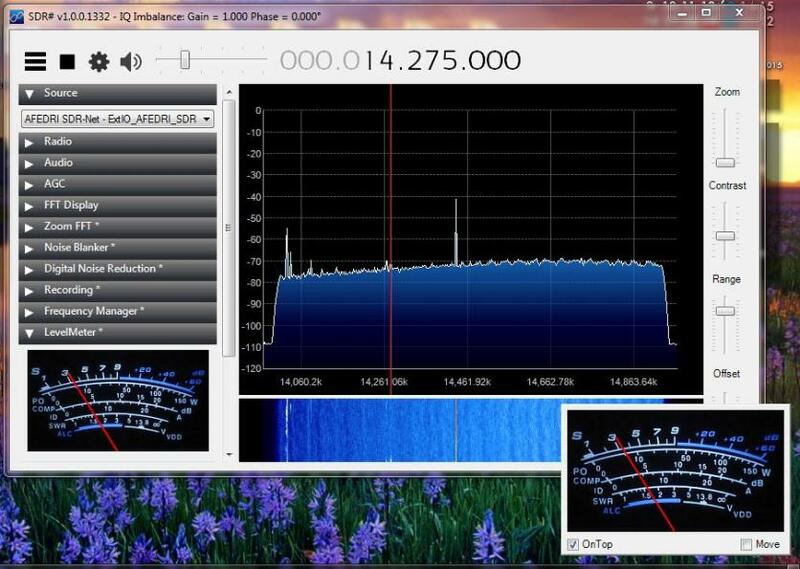 An attached SDR is not required, the interface will allow the IC7300 S-meter, Power On and off, Spectrum management, AGC management, and RF Power control from the PC mouse. AF and RF gain can also be adjusted with slider controls at the PC. the antenna for IC7300 transmit. 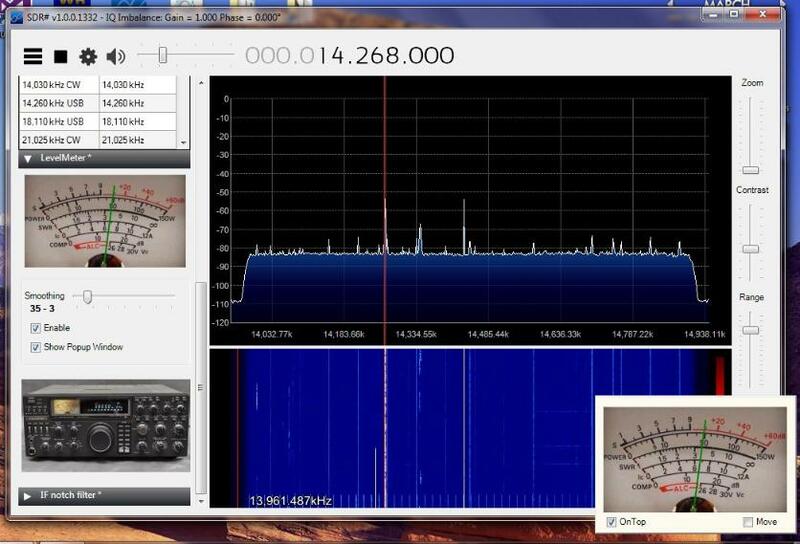 The SDR radio is muted by the program for IC7300 transmit. IC7300 CI-V address should be established in setup as 94h (the default)..
IC7300 C-IV Baud Rate should be established in setup as 19200. 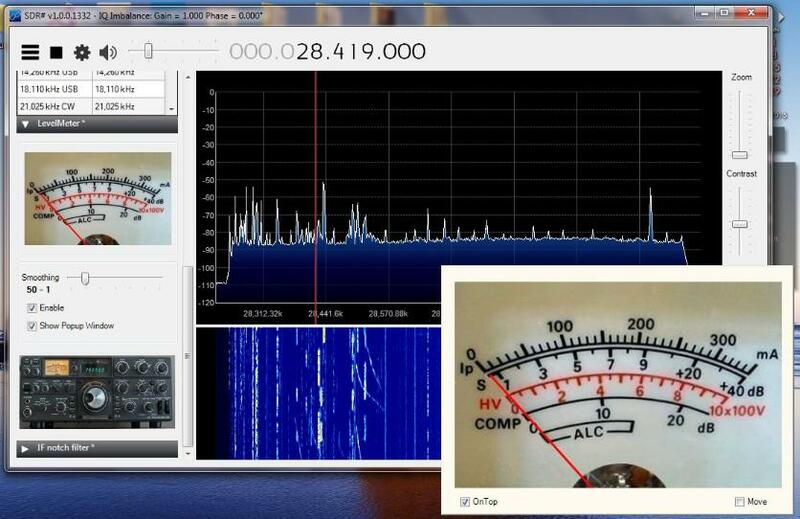 The SDR meter control panel is at the top and is captioned "LevelMeter". Just below it, the IC7300 panel area is captioned "SerialController". 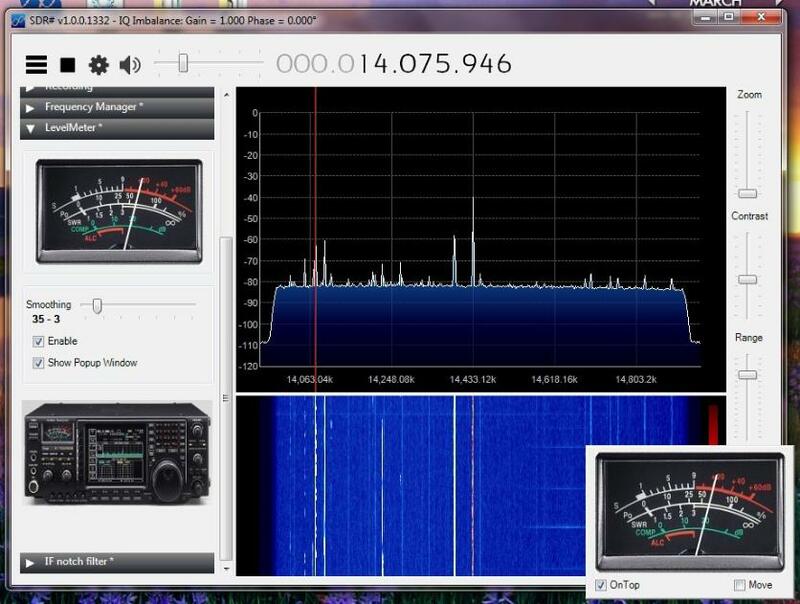 Start the SDR Sharp program from the complete folder provided, make sure to have the external 13.8v Power supply turned on that is feeding the radio, IC7300 can be off or on, as long as the power supply is running. Find the IC7300 COM port from the drop down list and select. Click the "Enable" checkbox to activate the interface. Click the "Icom IC-7300 19200" button to Power On the IC7300, or to connect if the radio was powered on using the switch on the radio. This same button will also Power Down the IC7300 when clicked. The S-meter will function. For FAST CW click the underlined M to set the IC7300 AGC to (Medium). The Center Spectrum button does not apply to IC7300, it is for the SDR spectrum display when activated. The button showing the frequency had a double purpose, in addition to displaying the SDR# frequency, it toggles the Digital S-meter for IC7300. Note - the IC7300 Digital meter looks identical to the SDR# Digital meter when it is called up. 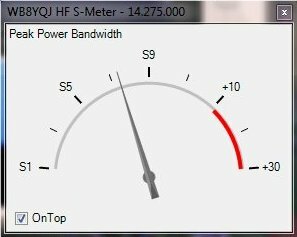 The SDR# S-meter is displayed on the program panel, and there is a checkbox "Show Popup" to show the external meter window. 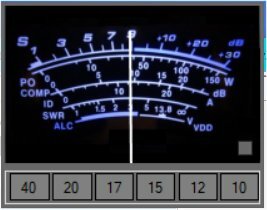 The labels on the SDR# Digital meter are the main method for changing the outboard meters configuration after displaying the window using "Show Popup". Example - click "S0" to show only the Digital Meter, click "+30" to show the Combo meter when "Show Popup" is checked at the panel. 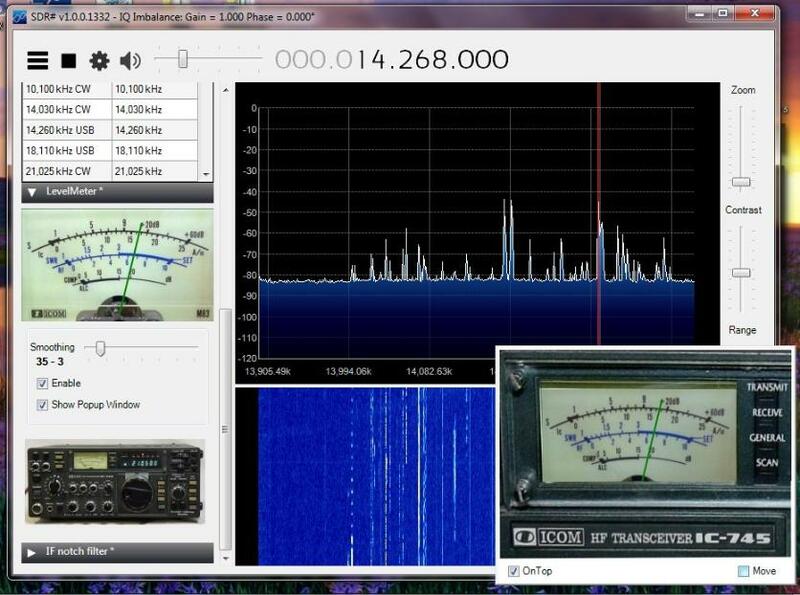 The S-Meter label values on the IC7300 meter do nothing when clicked, the window simply shows or hides based on clicking the SDR center frequency button on the panel which in the example above shows as "14.205,700 Hz". buttons reset the scope REF offset to zero. The A/B button is to swap A and B VFO. the same data port. This toggles 25ms, 50ms, or 100ms. There is a slider control for AF Gain and one for RF Gain. Click on the underline AF to change the value of the AGC set box (to the right of the "Center Spectrum" button). Click the AGC set box to set the IC7300 AGC value. saving some cranking of the Multi knob. The sliders remain dedicated to AF and RF Gain. This is the unmodified levelmeter control which reads straight dB with good accuracy but its too jittery to usefor HF reception. This is my first modified meter, which is 2 dimensional and matches the theme of SDR# nicely. I redraw the meter face and add theprovision to decay more slowly than the attack time. I also added a calibration method to the XML file. The newest acquisition here is the Afedri SDR-NET SDR Receiver. The great benefit with this is ethernet (LAN) connectivity in addition to the usual USB option. The LAN offers up to 2MHZ of recordable spectrum at one time. Having downloaded the Open Source for the Afedri Box Software, I have the program interface coming up minimized. Clicking at the bottom of the screen brings up this widget, which allows adjustment of the RF Gain control while leaving plenty of the screen open to see the affects on the Spectrum display. I have also added these Sample Rate buttons to allow quick access to a smaller recording size that will keep the files from getting too big. 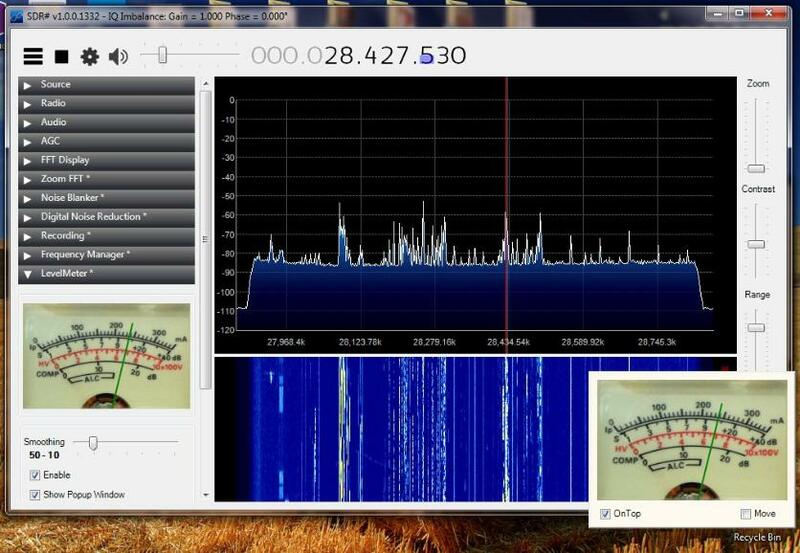 When not recording, the program defaults to 1MHZ sample rate and then the SDR application (SDR#) is used to quickly zoom in on a smaller value for the Spectrum Display. 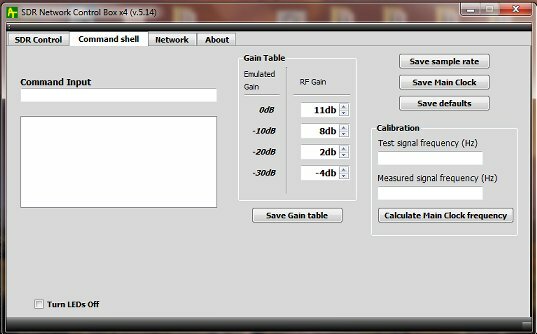 Program Auto-sets the RF Gain based on BAND selected. 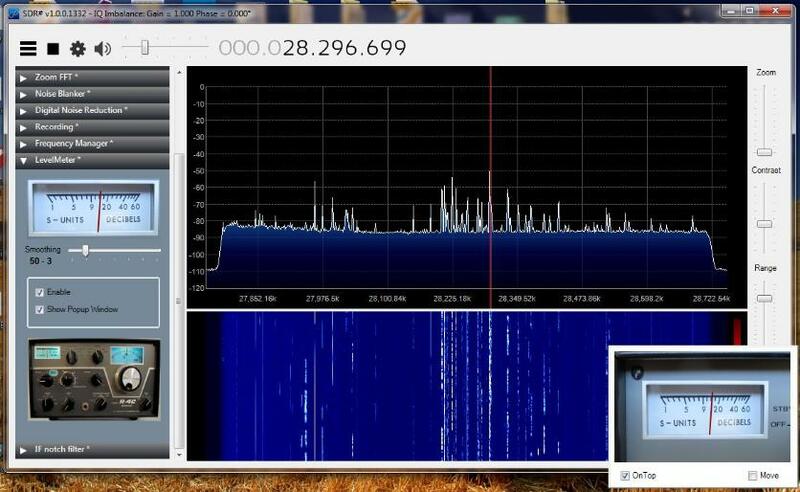 This same widget works great with the HDSDR SDR application. Dragging the widget window (at left) to make it bigger reveals this, a larger display of the Afedri Command Box program. It is still much smaller than the stock version of the program, yet all of the Single Receiver functionality is still contained within. The tabs and options that do not pertain to Single Receiver mode have been removed, greatly simplifying and reducing the tab clutter. Simplified Command Shell tab for setting USB sample rate and making small adjustments to the Master clock. 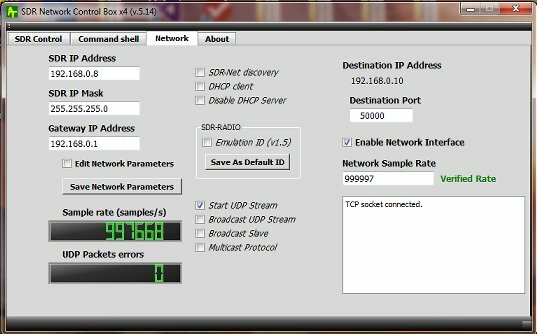 Simplified Network Tab, this is all that is needed for a Single Receiver.